I am the Diva's guest challenge this week (#173) is Redux, remix, revisit your comfort tangle(s) by changing things up a bit. I liked 'Nzeppel's look from the very beginning. When I found out the grid doesn't need to be consistent, I liked it more. Then when I realized the lines could be curvy too, I loved it! Isochor was a challenge to figure out, but once I relied on the shading, I was in awe of its look. Now to change them both up a bit... I hadn't tried 'Nzeppel using a pencil grid vs pen. Way cool. And to change it up a bit more, I just haven't made friends with the black tiles and the white gel pen, at least not before the CZT training. I still had a little problem with shading vs hiliting, but I think with a little more practice, we'll be good buddies. 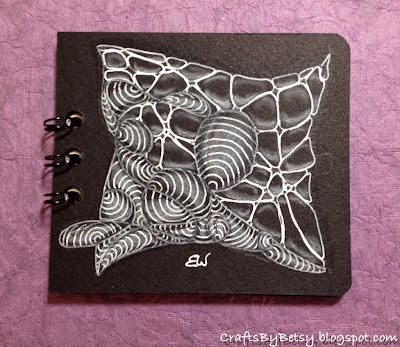 Thanks BJ for the cute "little black book" which has a drawing area that matches the 3 1/2 by 3 1/2 tiles! You did a great job with this black tile. Hi Besty! The CZT training was the first time I played with the black tiles, too. Thanks for sharing your journey. Love this tile and I love the way the Nzeppel looks. I like it. I have been experimenting with different white pens lately. Sometimes the Gelly Roll and I don't get a long too well, but I am on much friendlier terms with the Signo's (Angelic for fine lines, UM-153 for thicker.) They lay down nicely, but can be a bit trickier to shade (the UM-153 doesn't soak into the paper well, so you have to let it dry thoroughly, or even pre-shade under it.) I like the little book! What color are the insides? Thanks! I used the Gelly Roll. I have a Signo (don't see a number, guessing its the UM-153) and didn't realize they made a fine line. I'll have to look for the Angelic. Something more I need, but much cheaper than a new die cutting machine! The booklet contains several black pages with chipboard covers. Not sure what paper she used, but its quite nice. I will be covering it with nice Yuzen origami papers over the chipboard. No excuse not to practice my black tiles! The black tiles do take some time to get use to. I think it is as much the difference between the gel pens and Microns as anything. You can get some very stunning results though. I also like using the metallic gel pens on the black tiles. You did a nice job.